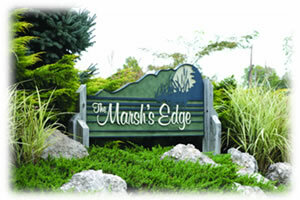 The Marsh’s Edge, located on Catawba Peninsula, is a pristine 60-acre protected wetlands in a prestigious 100-acre residential development. An abundance of nature greets you as you enter. The Great Blue Heron, the White Egret and Trumpeter Swans, just to name a few, are found here in their natural habitat. A two mile nature walk for residents only can be enjoyed with extraordinary views featuring songbirds and many species of ducks. Waterfowl like the Mallard, Wood Duck, Canvasback and Teal are common. The shoreline also offers a variety of turtles, several species of frogs and occasional deer.